Summary: As King’s How was named on both the O.S. and Bartholomew 1 inch maps it is unsurprising that Wainwright included it on his first two lists but yet it failed to have it’s own chapter in the Pictorial Guides. 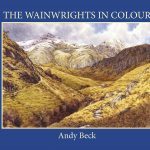 It would have been quite easy for AW to have given the fell a chapter to itself as not only does it have fine views but there are several points of interest in the vicinity worthy of mention or subjects for filling sketches (see below). However, he did feature this top as part of the Grange Fell chapter, perhaps if he had split Brund Fell and King’s How into two chapters it would have been to the detriment of the former unless he gave more merit to the east ridge of Grange Fell and it’s other tops (see the Grange Fell page). King’s How was unnamed on the 6 inch map published in 1900 as it was only in 1910 that the fell was named as a memorial to King Edward VII. 1250′ was a height shown on the 1 inch maps. 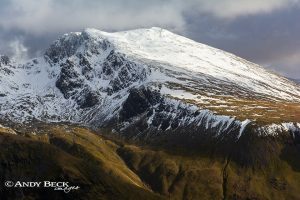 The summit can be attained from the Borrowdale road by two paths, one coming in from the north and the other from the south which can be planned to make an enjoyable short circular route witha little road walking. 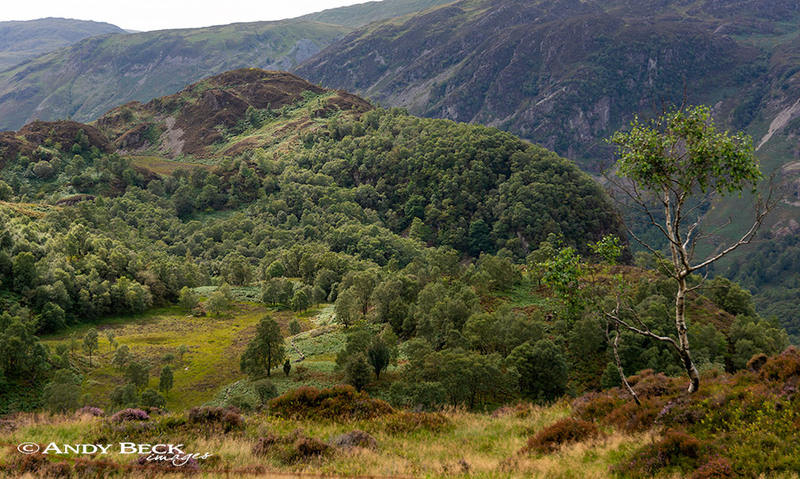 The terrain is a delighful mixture of woodland rocks and heather. Topographical details: The height of 1250′ from AW’s time has been re-calculated as 1286′ 392m and the Wainwright summit is the obvious high point, a bare topped area. In the past there were two cairns, a small one here and another more substanial pile on a good viewpoint 15m to the north-west, both are now totally gone. Someone has taken it upon themselves to remove them completely. Points of interest: When visiting the summit do have a look for the memorial plaque to King Edward VII just to the north of the summit, it is not easily found. The views south-west into Borrowdale right up to the Scafell range are impressive. 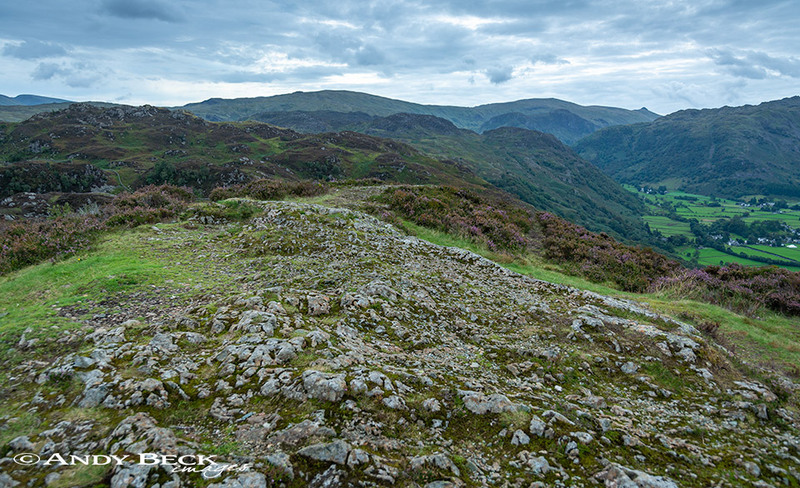 On the other side of the valley you look down onto the top of Castle Crag and King’s How is a good place to locate the caves of Millican Dalton. Northwards the view of Derwentwater and the Skiddaw massif is particularly spectacular and surprising that more visitors and photographers do not come to see this vantage point. On the lower western slopes of the fell can be found the famous Bowder Stone, a huge block of rock seemingly precariously balanced on one point with a wooden staircase to the top. Adjoining fells: Grange Fell (Brund Fell) can be reached by a short walk to the south-east. Nearest facilities: Car parking National Trust park at the Bowder Stone (pay and display), small car park with limited spaces at Red Brow (free). Tearoom The Flock Inn at Rosthwaite, food, drinks and accomodation at The Scafell Hotel or The Royal Oak in Rosthwaite. Star rating: (2.4 / 5) King’s How is a low fell of quality, wonderful views, points of interest and ease of access.